We had an awesome finish to the Wrath of the Lich King expansion. 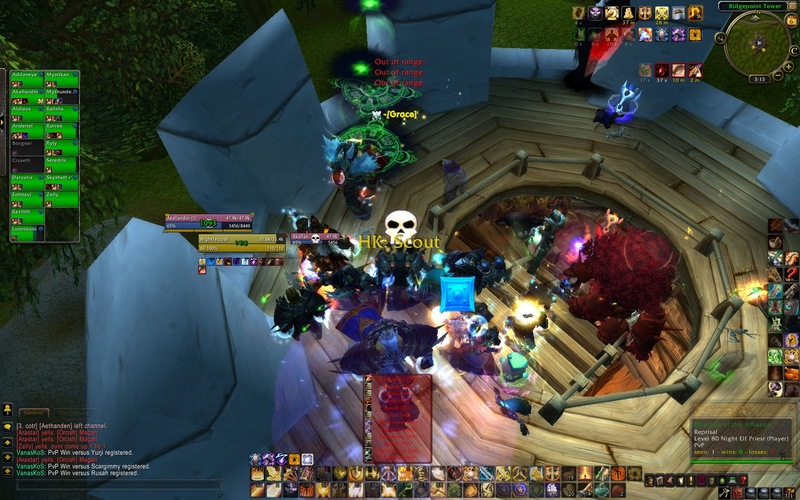 Altered and Afflikted’s group inspired a huge raid to come and back them up! Led by Arastar, they fought us right at the front gates of Stormwind! At one point I thought they had us, because they had managed to summon several more than we had and wiped us. But, we managed to get more too despite the late hour. We pushed/chased them back all the way to Ridgepoint Tower, where they came pretty close to wiping us again. They had taken up an awesome defensive position at the top of the tower, and people weren’t really paying attention or listening, and took a few spells to the face before they could even make it inside. We regrouped pretty quick and pushed them right out of their own position of choice! I guess our raid was feeling pretty good at this point, because if it was hard to keep everyone together before, it was impossible now. About a third of the raid wanted to go run and chase them right into the next tower. The rest of the raid sat at the rally point in Goldshire, waiting for them to realize they had no healers, but they never did. I passed leadership and moved on, along with several others. I told everyone good job in LocalDefense, and called it for myself. Just an overall great fight. We even backed off and let them rez several times, which is a courtesy we never get from a good amount of the Horde raiders present. That’s cause Alliance has CLASS! I logged over to tell a few of them good game: Arastar, Reckoning Day people, Nightrecluse – they all seemed upbeat about it. No time to put down all the names now, maybe tomorrow if I have the time. hey xelas don’t feel bad i missed it too, apparently the hordies wait for me to log out before they mess stuff up… on account of how /buff i am. Previous story Nobody puts Darvie in the corner!